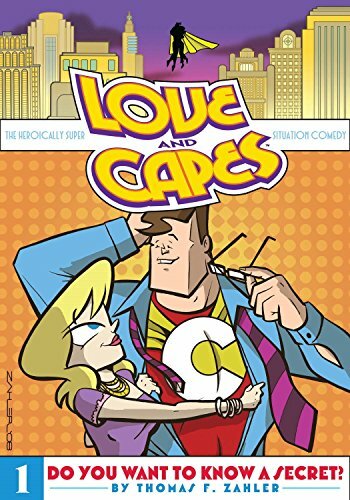 Love and Capes will return this summer! Details to follow soon! And if you came here from the old Love and Capes site, welcome! I’ve shut down that site for lots of reasons, and hope to return the online strip soon. Abby and Mark are a typical couple. At least, that's what Abby thinks. Unknown to her, her boyfriend is not just an accountant, but also the super-powered crime-fighter, the Crusader! See Mark tell Abby he's The Crusader. Abby always knew Mark was a good guy, she just didn't know how good. 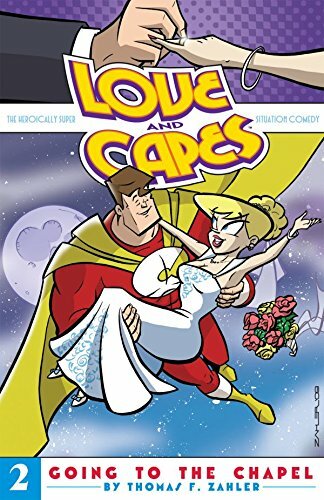 Nominated for two Harvey Awards, Love and Capes is a heroically super romantic comedy situation comedy in comic book form from Thom Zahler. "I’ve always liked superheroes, and I’ve always liked romantic comedies," says Zahler. "It was kind of a peanut butter and jelly moment. The ideas just started flowing after that." Zahler says that he was a fan of the cancelled "Lois and Clark" TV show. "It had its moments, for sure. But I found that I got bored whenever Superman showed up. Maybe it was that they didn’t have a handle on the superhero elements, or that the effects budget always showed. But the Lois and Clark moments were great. A friend of mine and I decided the best episode ever would have been the two of them locked in an elevator, and he can’t get out to change." "Not exactly. But most of the actual super-heroics take place off-camera. I think it’s important to treat the hero stuff seriously. I figure it’s kind of like ‘Friends’. Ross was a palentologist, but you rarely saw him palentogate, so to speak. So while Mark is the Crusader, you don’t see him do super-heroics very often." Can you write a whole super-hero book sans all the super-heroics? "Do you know how rare it is to truly laugh out loud while reading a comic book - even one designed to be funny? Most get a smile here and there. Maybe a huffing sort of chuckle. But Love and Capes legitimately makes me laugh out loud on practically every page. This is seriously good stuff. Read it!" Thom Zahler gets many things right with Love and Capes: laugh-out-loud comedy, spot-on superhero parody and fantastic art. But what makes this series so addictive are the relationships, which are some of the most real and compelling in any medium. "A comic book hero's marriage often ends in divorce, retcon, or reboot, because too many creators don't know what to do with them. Thom Zahler knows JUST what to do with a married hero and spouse--TELL STORIES ABOUT THEM! And what delightful stories they are!" 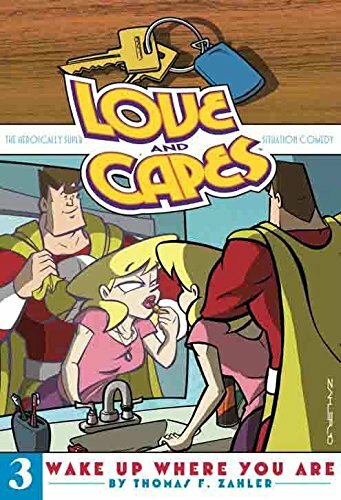 “Love and Capes is warm, witty, clever and lighthearted without being empty-- there's real, satisfying emotion underlying the comedy. It's one of a very few comics my wife tries to steal from me so she can read it first." "Damn straight it is. And what do you mean, 'tries to'?" “A surprisingly charming tale about a hardworking superhero and his girlfriend... Thomas F. Zahler’s boldly cartoony artwork recalls "The Incredibles," and so does his wry, smart dialogue. A-"
“My favorite superhero book on the market today." "A book full of rare delights--bright, lively art, a fun and clever story told with perfect pacing, and a fresh look at the best (and sometimes silliest) tropes of superhero-hood. Thom Zahler's doing great work on an irreplaceable book."